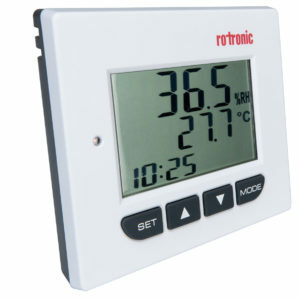 This is a compact temperature and humidity display, ideal for displaying temperature, relative humidity and dew point in rooms, labs cabinets, storage or your work environment. Easily mounted on the wall, thanks to its integrated fastening points or set it up freestanding on a flat surface. Clear and visible display for easy reading, even from a few meters. With clock, time and date functionality. These digital Max/Min thermometers feature large, easy to read dual displays with max/min memory functions and a programmable audible high/low alarm. The model P1000 Max/Min Thermometer measures temperature over the range -50 to + 70°C or equivalent °F with a 0.1°C/°F resolution. The temperature sensor attached is waterproof with a 2 metre PVC lead for outside temperature measurement. Waterproof external sensor with a 2 metre PVC cable. 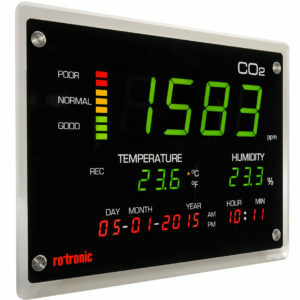 This CO2 display is the latest development that simultaneously measures and records CO2, humidity and temperature and can be wall-mounted or sit on a bench-top. Configurable directly via buttons and stored data can be exported to a USB memory stick for analysis with the free ROTRONIC software package SW21. 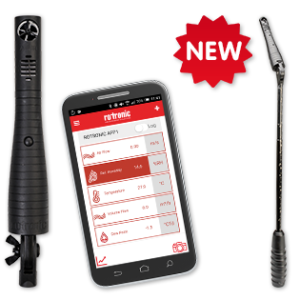 This instrument offers unbeatable value for money, equipped with a stable ROTRONIC HYGROMER® IN-1 humidity sensor. This economical digital max min thermometer features an easy to read display and simultaneously shows the current, max/min temperatures. This thermometer is ideal for grow rooms, greenhouses, care homes, offices and other buildings for monitoring temperature to prevent plant damage or conserve energy. This thermometer measures temperature over the range -50 to +70°C or equivalent °F (switchable) with a 0.1°C/°F resolution.